Dr. Warm is well versed in a variety of modern plastic surgery techniques and has years of surgical experience. 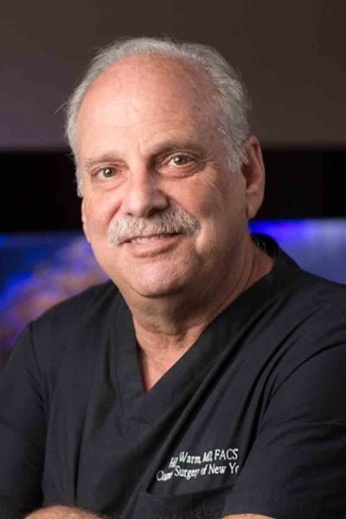 Drawn to plastic surgery because of the high standards of excellence, he completed his Plastic Surgery Residency at the Medical University of South Carolina in 1988. Dr. Warm joined the CSNY practice in 1988. After earning his B.A. from the State University of New York at Buffalo, Dr. Warm attended the University Autonoma of Guadalajara, graduating in 1979. Following this, he completed a fifth pathway program at the State University of New York at Buffalo Medical School and was granted an M.D. degree from the State of New York. During his General Surgery Residency at Millard Fillmore Hospital in Buffalo, NY, he was Chief Resident for the last two years. It takes only a moment with Dr. Warm to know what kind of surgeon and caregiver he is. Raised in Tannersville, NY, in the heart of the Catskill Mountains, small-town sensibilities guide his life and enrich those around him. Neighborly reliability and responsibility rule the day: A promise made is a promise kept. Dr. Warm cites his father as a major influence, as he helped found the Tannersville Rescue Squad, an area that had limited access to emergency services. “When people need help, you get it to them.” Dr. Warm applies the same principle to all facets of his personal and professional life. An active husband and father, he and his wife enjoy simple pleasures with their children. Among favorites is combing the beach for seashells and beach glass. Dr. Warm is one of only 40 surgeons in the US selected by Inamed Pharmaceuticals to participate in its cohesive gel implant study.